Dr. Hueck and the awardees for the science department. Miami High’s Departmental Awards Ceremony was held on May 22. Students and their family members, faculty, and staff gathered in the Theater to honor students that have excelled in different subject areas. “There are 3,000 students at Miami High, and only about 200 will be awarded here today. You guys should be very proud,” said principal Mr. Valdes to the awardees. The ceremony continued with Principal Valdes recognizing the seniors who would graduate with the AP Capstone Diploma of Distinction. Awards were given in all academic areas including ESOL, Fine Arts, Journalism, Science, Math, and Reading. 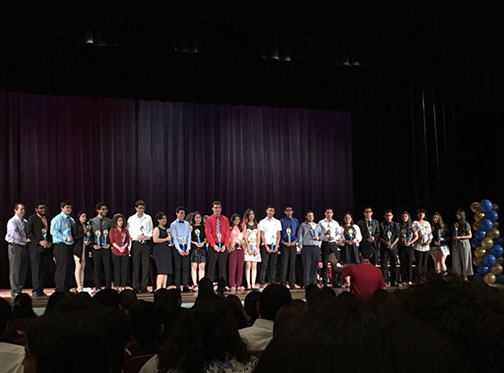 Some of the recipients were Daisy Perez for Outstanding Medical Student, Emmanuel Fuentes for Outstanding Graphic Design Student, and Darlyn Bracero for Academic Excellence in Journalism. Congratulations to the awardees!